Harry Bennett, who leads Nevada City's "Floracy" cannabis extract manufacturing, is one of the first purchasers of legal, tested, medicinal cannabis products Wednesday afternoon at Elevation 2477' Nevada City's and Nevada County's first cannabis dispensary, set to hold its soft opening Thursday at noon. A momentous occasion many decades in the making took place Wednesday afternoon — the first legal sales of cannabis in Nevada County. 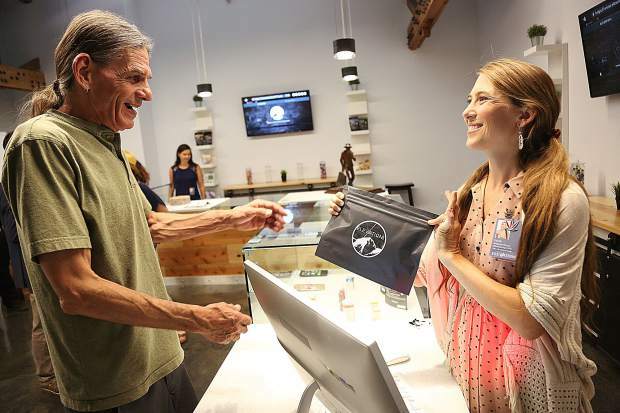 Diana Gamzon of the Nevada County Cannabis Alliance was the first to walk through the door of Nevada City’s medicinal cannabis dispensary, Elevation 2477’, located at 569 Searls Avenue in Nevada City. Longtime cannabis advocate Harry Bennett was the dispensary’s second customer. The dispensary is slated to hold their soft opening to the public today at noon. The dispensary already carries edibles, tinctures, salves, pre-rolls, 10 different types of cannabis flower and several different types of vaporizer cartridges. Though the dispensary has yet to open their doors to patients, workers there have already been getting requests to carry certain products, which they say will try to accommodate as much as possible. “It was an incredible day to see that first purchase happen,” Batchelor said.